What rule do you think you broke? 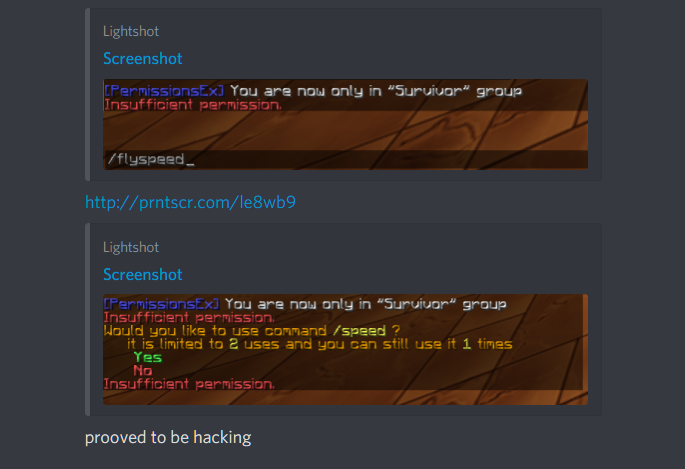 : He broke no rules, but was alleged to have a hacked/modded client. Why do you think you should be unbanned? : He broke no rules. In my opinion the evidence provided doesn't show enough evidence of a hacked client. The speed he was travelling could've been as a result of so many factors: Leo's momentum (as the moderator that couldn't catch him was trying to "catch up" from standstill, this would be impossible if they both had the ability to fly at the same speed) latency issues could possibly present as a difference in speed until both players had stopped for a few seconds, Any "friction" with the walls or ceiling whilst the moderator was flying could have slowed them down slightly by comparison, The strange behaviour tendancies the game has whilst flying in a tunnel. All of the above is aside from the fact that I know there to be no mods or hacks on my computer which Leo was using at the time of the incident. I'm not saying a ban was imposed with any malice, but simply a mistake. I know Leo doesn't cheat or use hacks and is certainly no liar. Written on behalf of Leo by his dad Ben aka Monumental. I've just watched the "evidence video" again in full screen. Please note that at most points during the "chase" video Leo is still on screen and not leaving the moderator behind and disappearing from view. In fact the moderator is at many times catching up to him. The only time Leo actually starts to "pull away" during flight is when the moderator is clearly in contact with the wall of the tunnel. Please review this footage with the scrutiny it deserves. Bottom line, is that Leo does not have access to fly speed. Also ninja is not this fast and can't build up momentum like this. This obviously leads to speed hacks and this will not be tolerated. I think MonuMental is getting fooled by their child and they are getting away with things they should be "dad". I wasn't entirely basing my assumptions of his innocent on the case of /flyspeed command. As I've mentioned, there could be lots of factors contributing to it appearing as though he's travelling much faster. The evidence video on youtube actually proves quite the opposite in my eyes as he never leaves the moderators view. If he was faster than her, he'd disappear from view. "The Bottom line" is he logged into his account on my PC right under my eyes and I was watching as the incident occurred. I mean what on earth would he possibly have to gain from using a hack to fly through a tunnel fast??? Anyway, I'm not going to argue this any further. You're clearly not interested in investigating this issue to it's extent. Much easier to just brand my son a cheat and a liar and call me a fool! First and foremost: There is no reason to post a new appeal when the current appeal is still under review. We are well aware that you are anxious for a final outcome, but continuously harassing staff is not going result in a quicker determination. This is your only warning on the matter. 1) Before a player is punished for breaking our rules, we scrutinize their behavior before acting. Nobody wants to be falsely accused, and we certainly don't enjoy having to punish our players. When it comes to ban appeals, our entire staff team reviews the documentation just in case the staffmember reacted hastily. 2) The video evidence has been reviewed multiple times by the staff team. * Leo first claimed that the reason he was going so fast was due to CEs on his armor. We verified that the CEs he claimed gave him the speed boost did not give *that* significant of a speed boost. * It was then claimed that he had access to /flyspeed and we verified that he did not have access to that, nor do any of our players. * The staffmember did not hit the wall causing friction which would slow her down. The only time she lagged was when she was teleporting to Leo in an attempt to keep up with him. * It was never stated that Leo flew out of the vision of the staffmember, like you claim. What *was* stated was that she was not able to keep up with him even with the perks of being a staffmember. * As this is still under review, more and more information is coming into play from both of you. You have gone from being in the room to now suddenly having been watching over your son's shoulder at the exact moment this recording happened. No offense, but I find that highly unlikely. 3) I commend you for standing up for your son and wanting to fight for justice. As a parent with a child who plays Minecraft, I know where you are coming from. However, where there is blatant proof posted, you may need to take a step back and look over the evidence and the comments from staff with non-parent glasses on. Finally, as I previously mentioned, this appeal is under review. We are respectfully asking you to not continue posting. A decision will be made within the next 72 hours. Please verify he is not hiding hacks from you or uninstalled before you were able to see them. He will be unbanned this Thursday afternoon as that will be a week.